Vastu Shastra planning for set design for film Movie show, studio for TV Channel Serial and also Film. How do you create the best Vastu environment to support the success of a film or serial T V show. The ideal Vastu arrangement creates a space that has the powerful positive energy. It supports a specific activity intended for that space. Success & TRP is better with Vastu arrangement in the entertainment world. It will be a good show audience will pay to see. When it comes to managing your daily shooting work, one of the most important things you can do for your team by setting the right environment at work. A positive work surrounding makes people feel more valued and enjoy coming to work every day. It will have a huge impact on their creativity and performance. Details on the surrounding, i.e. road, slope, river, hill etc. A wrong slope of the plot could impact the performance of the show. T junction or Dead end road location should be avoided. T junction in any direction i.e. east, west, north or south is a big No as per Vastu. Entrance to the set, Main entry to the studio is very important for actively drawing in positive energy. The Internal arrangement of the set based on the theme of the show. This includes colours, wall paintings, object, as well as internal furniture. The exteriors of the set to the set. The location of the artist’s makeup room, direction and also its internal planning. The direction & placement of the generator van (Vastu element-fire). The direction & placement of drinking water (Vastu element-water). The direction & placement of the Plants ( Green Zone). Roof slope of the set, Roof slope towards the east and north is most auspicious. The Direction of Storage of the shooting material. Enhancing the space energy by using various Vastu enhancers as well as symbols. 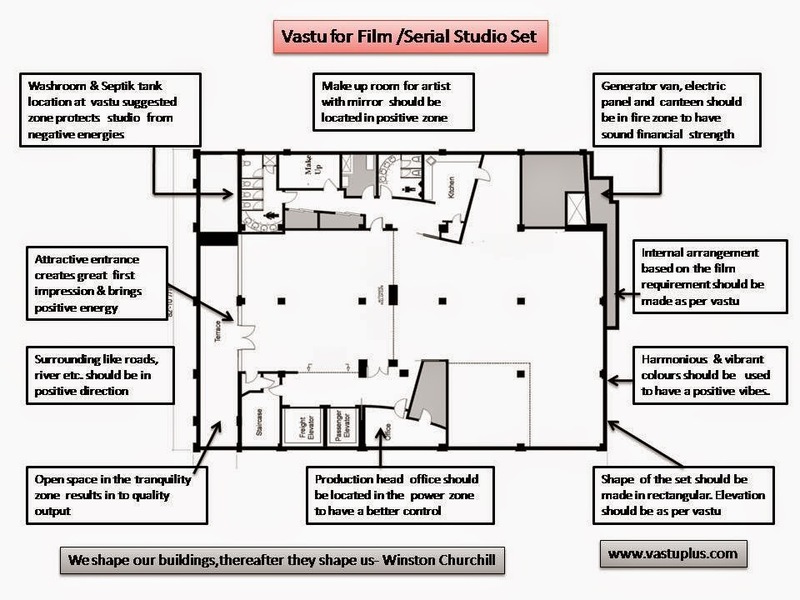 Above are the few suggestions & tips on vastu for studio set locations for TV serial or Film, and cinema. There are many corrections available to cure Vastu defect without making any major changes in the layout. We have worked on studio design for TV shows located in and around the Mumbai including a film city.